The moisturemeter for the professional farmer. The Agromatic Digital Super I is an advanced digital instrument for measuring the moisture content in many different commodities. 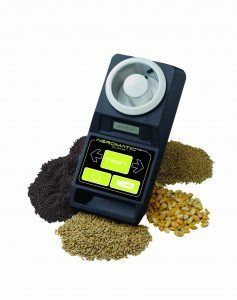 The instrument is ideal for whole seed’s but several other commodities such as flour are available. Thanks to its ability to measure the moisture content on whole seeds its a fast and reliable instrument which only needs in-frequent cleaning compared to instruments using a mill to grain the seeds before measuring. To ensure the best and most reliable measurement a build-in scale is used to ensure the sample is the same size – measurement for measurement. Finally a build-in temperature-sensor ensures that even commodities in drying plants can be measured while its processed without need for cooling. Advanced technology makes it possible to store many commodities on a standard USB flash drive (max size is 2Gb – FAT 16). Up to 500 different commodities can be stored . The instrument comes preinstalled with 8 commodities.